For the women, many familiar female character tropes are on display. 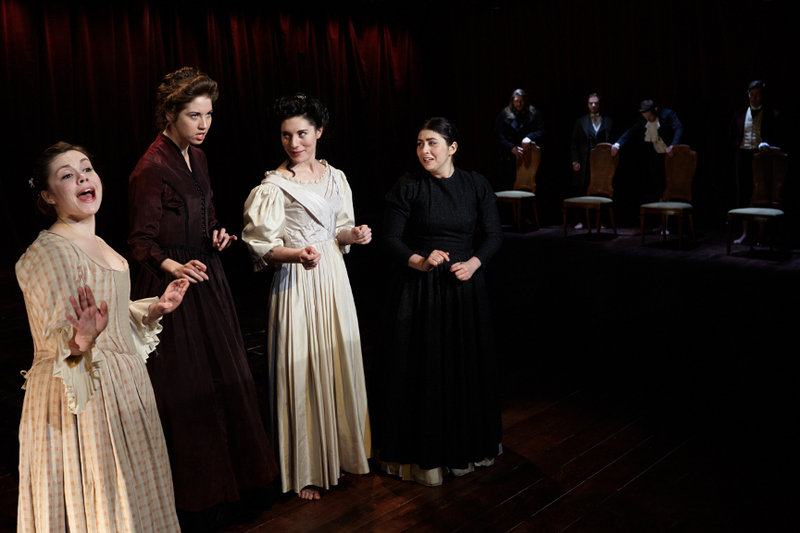 There is the emotionally fragile Jane, the head-strong Jo, the judgmental Elizabeth, and the passionate Catherine. Young female readers see themselves in these characters and then pigeonhole themselves into that type. How many sisters identified themselves or each other as a Jo, a Beth, or an Amy? Despite their various distinctions, all of these characters are all destined to be wives. Even Jo, who leaves home to be a writer in New York City, has a German professor waiting for her at the end of her story. Their male counterparts similarly represent damaging male character tropes. Darcy is emotionally stunted and socially awkward. Heathcliff is all rage and temper, the embodiment of toxic masculinity. Rochester is fundamentally dishonesty and manipulative. Laurie is the “good guy” in the Friend Zone, complaining that he has earned Jo’s love and she somehow owes him. It reduces everyone involved, and none of them get to be full three-dimensional people. The first half of the show is fairly straightforward. All of the women re-tell their stories and debate their futures, and the men worry that the women will take off across the moors, never to be heard from again. The second half of the show is where the real deconstruction begins, and some audience members might feel a bit lost, especially those less familiar with the original source material. All the clues are there, but the show does not hold the audience’s hand. For me, two of the show’s most powerful moments happen in the second half. The first is Jane Eyre’s ambition to be an astronaut. Out of all the characters, Jane Eyre has the least control over her destiny in her original book. Though she is educated, she is an orphan with neither riches nor beauty, and the man controlling her livelihood is unsure of his affections at best, unstable at worst. She only has two viable options, to marry and travel to India as a missionary’s wife, or to act as caretaker to a blind and physically disabled Mr. Rochester. What is the most improbable future for Jane Eyre? To become an astronaut, something that people dream of and only a few ever achieve. To go to space and live in happy solitude, learning to exist alone. She might as well have asked for a pet unicorn, and yet Jane Eyre’s dream comes true. Imagine what that could mean for young women, seeing that on stage. The second moment is at the height of the war between the men and the women. 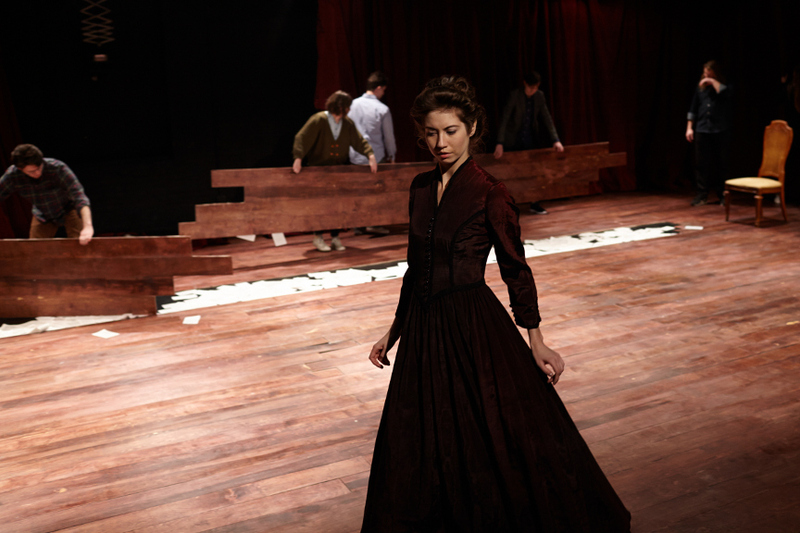 Everything comes to a screeching halt, and the cast begins tearing up the floor boards of the stage. Underneath, there are pages of their stories scattered everywhere, poking up through the cracks in the floor. They do it because these characters and tropes are deeply ingrained into our culture. These battles for feminism and equality are colored by them. Until the foundation is torn up and the toxicity revealed for the world to see, men and women will continue to be held back. There needs to be a chance for another ending to be written, one where Elizabeth Bennett got an Alzheimer’s research grant, Jo is a war correspondent, and Jane Eyre is an astronaut. That is an ending worth fighting for, and a show and message worth celebrating. One last note, the cast is all great, but the MVPs are easily Preston Martin as Darcy and Sam Corbin as Jane. I have never seen Darcy played in quite that way before, and Corbin’s wobbly space-legs are just perfect.